The wedi Fundo Riolito is a unique and fully prefabricated tileable unit featuring linear or channel drains. Water drains away through a narrow gap between the cover plate and adjacent tiling. The wedi Fundo Riolio shower drain can be installed with wedi® Building Panels and Curbs to guarantee a waterproof assembly. The Riolito offers three cover plate options for the integrated channel drain, each made of high quality stainless steel. By adjusting cover plate height, the Fundo Riolito can be combined with nearly any tile or natural stone surface, in a range of thicknesses from 1/4” to 1/2” for the Standard or Deluxe channel covers and from 1/4” to 3/4“ for the tileable channel cover. The Riolito includes a drain set that can be glued to a 2” pipe (ending 1-1/8” below floor top surface) using solvent cement glue. 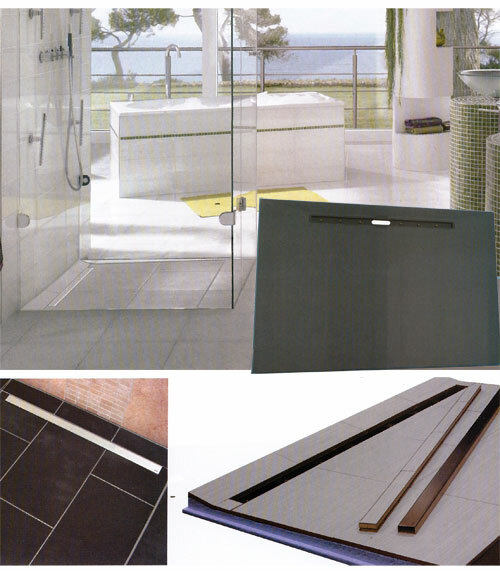 The Riolito is a great solution to enable homeowners, designers and installers to take bath design into the future. Fully tested for superior performance, this system is the ideal blend of innovation and practical application. - The drainage rate is 16 gal/minute. - The prefabricated slope is 1⁄4 in/ft. - Even large-format tiles can be used in the thinbed process. Fundo Riolito has a true level slope and is ideal where ADA requirements should be met. • Bucket • Notch Trowel • Drill with Thinset Mixer • Utility Knife • Straight Edge / T-Square 5 ft or longer • Speed Square • Caulk Gun • Handsaw • Flat Head Screwdriver • Cordless Drill or Hammer • Solid Putty Knife • Paper Towels • Level • Circular Saw • Saw Horse • Tape Measure • Permanent Marker • PVC Pipe Cement Glue and Primer • Inside PVC Pipe Cutter. • Sub floor is level, sound and meets deflection criteria. • If Shower base is to be installed floor level, make sure you build out a stable depression and deep enough to receive base + thin set • 2” PVC pipe is cut 1 1/8” below top of sub floor surface. • 2” drain assembly below floor is stabilized and will not sink under water load. • Make sure wedi® drain and 2” pipe is safely connected using PVC cement and primer. • Only wedi® products (wedi® sealant, wedi® fasteners, wedi® building panel, wedi® curb, wedi® ramp) are used for wedi® Fundo Riolito assembly. • Installer has been instructed by wedi® staff or has been informed about proper wedi® assembly steps through wedi® installation brochure and video. 1 - Cut the 2” pipe 1 1/8” below the top of the subfloor surface of the floor construction. Make sure that the cut out fits to the Riolito panel drain. 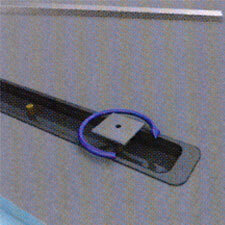 Cut out a 4 1/4” diameter hole around the 2” pipe to allow the wedi® drain to be inserted into the subfloor. The drain and trap must be securely fastened to the sub floor. 2 - Assemble the drain unit following the instruction drawing. 3 - Glue and seal the wedi® drain body to the 2” pipe. Mount the sealing collar to the wedi® Riolito underside counterpart. 4 - Skim coat the thinset (ANSI A118.4) and comb through with a 1/4” x 1/4” notch trowel. Channels pointing to the entrance. 5 - Trowel the thinset on the rear side of the Fundo Riolito again using a 1/4” x 1/4” notch trowel. 6 - Press the Fundo Riolito firmly into the thinset bed, ensuring that the installation is level and void free. Apply weight (thinset bags) equally across the Fundo Riolito base. 7 - Set up a continuous 1/2” bead of wedi® sealant along the base’s channel on the outer perimeter. Note that the wedi® joint sealant starts setting up after 15 minutes. Set the beads separately for each panel installed. 8 - Install the wedi® panels around the Fundo Riolito, fixed and sealed in the Fundo Riolito channel’s bead of sealant. Fasten the panels directly to the studs using one wedi® fastener per foot. One extra fastener is set in between seams of panels to create a flush transition. 9 - Set up continuous 1/2” beads of sealant between and in all seams to adjacent panels. Excessive sealant is smoothed out us ing a putty knife. An addition al 1/2” bead of caulk is set along the inside bottom joints connect ing the wall panels and base and spread flat over the joint, achieving a coverage of at least 3/4” on both sides of the seams. All fasteners are covered with sealant. 10 - wedi® Niches are installed in a cut out in the wedi® wall and attach with it’s flange right into the center of 16 o.c. studs. wedi® Joint Sealant is set along the connection of wall to niche. 11 - (2) fasteners on each side of the niche are set to create a flush transition to the wall panels. Another 1/2” bead of wedi® seal ant is spread over fasteners and seams. 12 - A continuous 1/2” bead of sealant is set into the channel and along the vertical curb notched part. A 1/2” bead of seal ant is set against both wedi® walls. A 1/2” bead of thin set mortar is set on the floor. Cut wedi® curb to fit tightly in the opening, and then press firmly into place. 1 - Mount the screw heads to the threaded bolts inside the drain channel and bring them to the desired height so that the drain cover finish will sit slightly lower or flush with your tile or stone. 2 - Align the square screw heads so that the drain cover finish can be inserted. The screw heads will support the drain cover finish even under heavy duty conditions. Each drain cover set contains two white hard PVC spacers, which can be inserted into the channel to help align your tile to the channel’s edge. Contemporary Vibe Meets Traditional at This Beautiful House in Langley, B.C.